Northants Veggies in The Vegetarian magazine! 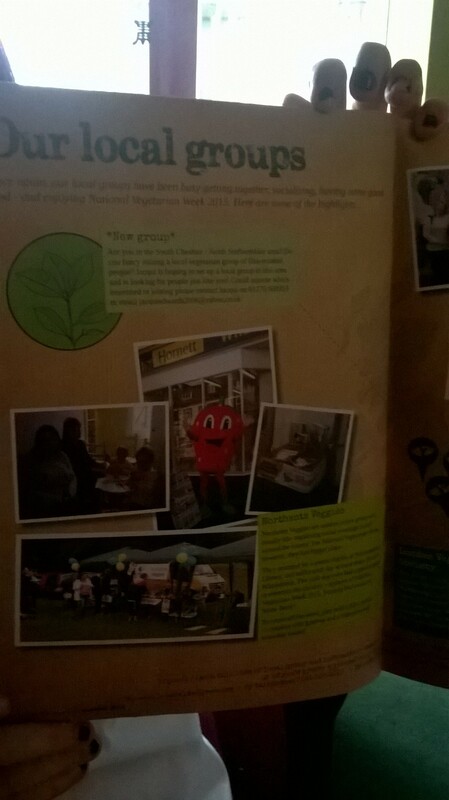 You can see above a fairly low quality picture of almost a whole page of our activities for National Vegetarian Week in VegSoc’s membership magazine, The Vegetarian! As you know, we had a very busy week with BBQs, craft days, taster events and a visit to Hornett Wholefoods from the main sponsor of the week – Nothing But. It’s always pleasing to see that VegSoc appreciate the efforts we put into it – well done everyone who took part, whether you helped out anywhere or came along to something. “They arranged for a poster display at Northampton Library, and held a craft day at local shop, Hornett Wholefoods. The craft day even had a special guest to entertain the children – sponsor of National Vegetarian Week 2015, Nothing But’s macscot: Straw Barry!